18-year-old figure skater, Callum Mills, has faced many challenges in his life. He was born with CHARGE Syndrome, which effects his hearing and balance, as well as a heart condition, and autism. 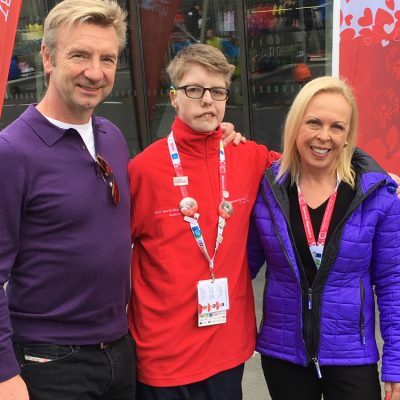 He first took to the ice at Everyone Active’s Lammas Leisure Centre at just 12 years old, after his mother hoped it would help improve his coordination and stability. Since then, Callum has gone on to win gold medals in Inclusive Skating at two consecutive Special Olympics. He also competed on an international level for Team GB at the Special Olympics World Winter Games 2017 in Austria. Away from the ice, Callum has been studying for his GSCE’s and is looking forward to continuing with his education at college. Callum is determined to continue improving and to represent Team GB on the international stage. With the support of his family, coaches and Everyone Active, he would also like to begin competing in non-inclusive events.